Since the restaurant opened, staff members have reported several strange experiences. Again, apparitions appear and then quickly vanish, voices and sounds come from nowhere, and glasses will often lift off the bar flying through the air by themselves. On other occasions, doors are said to lock and unlock by themselves, lights inexplicably turn on and off of their own free will, and the piano bar often plays when no one is near. 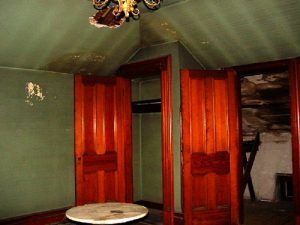 Said to be haunted by several members of the Lemp family, there are three areas of the old mansion that have the most activity — the stairway, the attic, and what the staff refers to as, the “Gates of Hell” in the basement. It is this area of the basement that used to be the entrance to the caves running below the mansion and the brewery. The attic is said to be haunted by William, Jr’s illegitimate son, referred to only as the “Monkey Face Boy.” This poor soul, born with Down’s Syndrome, spent his entire life locked in the attic of the Lemp Mansion. Strange occurrences are often witnessed on this third floor level of the mansion. The face of the boy has regularly been seen from the street peeking from the small windows of the mansion. Ghost investigators have often left toys in the middle of his room, drawing a circle around them to see if the objects have been moved. Consistently, when they return the next day, the toys are found in another location. William Lemp, Jr. October, 2004, Kathy Weiser. In the downstairs women’s bathroom, which was once William, Jr’s personal domain and held the first free-standing shower in St. Louis, many women have reported a man peeking over the stall. On one such occasion, a woman emerged from the bathroom, returning to the bar and stated to the two men she was there with: “I hope you got an eyeful!” However, the two men quickly denied ever having left the bar, for which the bartender verified. This ghost is said to be that of the womanizing William Jr. 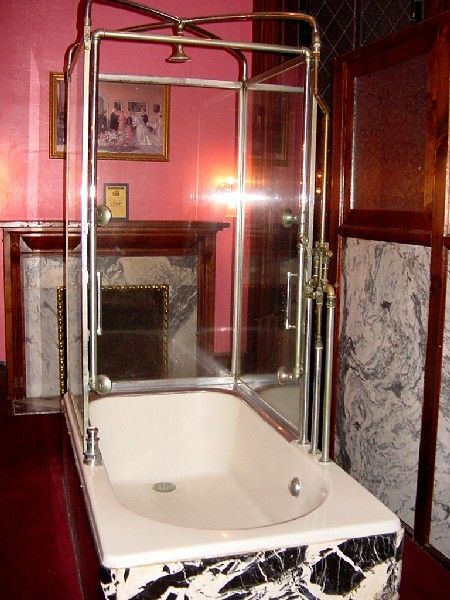 In William Lemp, Sr’s room, guests have often reported hearing someone running up the stairs and kicking at the door. When William killed himself, William Jr was known to have run up the stairs to his father’s room and finding it locked began to kick the door in to get to his father. Several years ago a part-time tour guide reported hearing the sounds of horses outside the room where William Lemp, Sr had kept his office. However, when the tour guide looked through the window, nothing was there. This area, north of the mansion and now used as a parking lot, was once utilized as a tethering lot for horses. The mansion has been featured in a number of magazine articles and newspapers and now attracts ghost hunters from around the country. Today it features a bed and breakfast with rooms restored in period style, a restaurant featuring fine dining, and a mystery dinner theater. Tours are also available at the mansion. The Lemp Mansion is located at 3322 De Menil Place, a short distance from the Mississippi River. To get there Take Broadway from Interstate 55 and follow that to Cherokee Street. Go west on Cherokee and turn right onto De Menil Place. 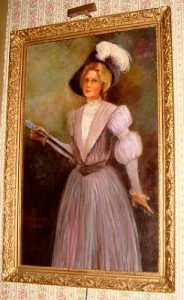 On Saturday, October 9, 2004, Kathy Weiser and Amy Stark visited the Lemp Mansion along with St. Louis historian Joe Gibbons. 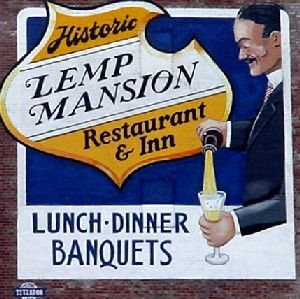 Joe has spent many years researching the Lemp Mansion and often gives tours of the inn with the permission and cooperation of the owners. Meeting up with Joe at the bar, we settled in for a bit, pulling on a couple of lagers and chatting it up with Joe. After Joe very kindly introduced us to Patty Pointer, he began to show Amy and I around the mansion. As Joe described, in intricate detail, the history of the Lemp Mansion, the land on which the mansion stands, and the many strange occurrences in the haunted building, our tour took on new members. By the time we reached the attic, there must have been more than twenty of us. While we were on the tour, several strange events occurred. The first was when we were standing in the darkened attic. As Joe described the “Monkey Face Boy,” I began snapping pictures in the darkened room. Soon, I was approached by a woman who had joined our “unofficial” tour. She wanted to know if my shadow would appear on the wall when I took a picture. To this, I responded, “no, because the flash is in front of me.” Perplexed, she continued, that when I took one picture in the attic, that she saw the distinct shadow of a person against the wall. Hope against hope, I quickly scrolled back through my digital images to see if a shadow appeared, but there was nothing. 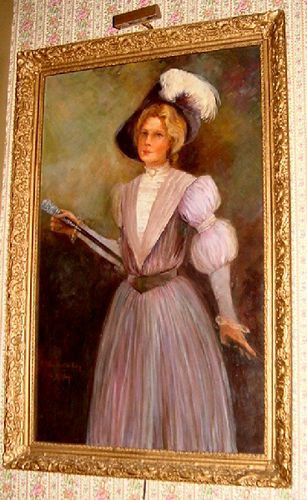 It was in this room, that the woman said she saw a distinct human shadow on the wall when this photograph was taken. By Kathy Weiser-Alexander. As we began to make our way back down the stairs and passed by William Lemp Sr’s room, Amy pulled me aside because the door was standing wide open, with the key in the door. Not going in, we just wanted to peek. We continued our journey down the hall when an alarm was raised by the guests of the room. When they had arrived back from dinner, they found the door wide open and were looking for a manager. However, there was no key in the door when they arrived. A manager quickly responded — it was “impossible” that there had been a key in the door, as there were only two keys to that room. One was in the hands of the guest, the other in the hands of the manager. So, who opened the door, and where was the key that we saw when we passed? Later, several members of the group would describe having passed a man in the hallway, holding a key in his hand and described as acting irritated with the large group moving through the hallway. Described as pale, older, and wearing a white shirt and black pants, no one thought anything of it at the time, believing him to be a member of the staff. However, we would find that there was no such gentlemen working or staying at the mansion that night that met that description. Though no harm was done and nothing was disturbed in the guest room, the whole experience was very bizarre.